Jim Archibald’s passion for reading built during his days studying as a “D-Level guy” at the Eisenhower Library, the heart of the Sheridan Libraries and University Museums at Johns Hopkins, and, later, in law school. An attorney and vice president of administration and regulatory affairs for Wm. T. Burnett & Co. and STX, Archibald still sets aside plenty of time for reading. He and his wife, Joanne, own more than 1,000 books — many of them tomes about Jim’s beloved Maine. Long-time university supporters, the couple recently established a charitable gift annuity that will benefit the Sheridan Libraries’ future needs. Here, he and Joanne, a realtor with Long & Foster, talk about their love of all things library-related. 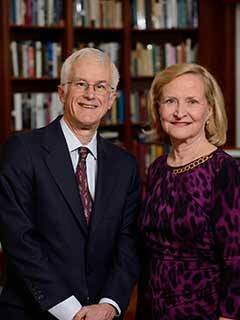 With a charitable gift annuity, the Archibalds have preserved a passion for all things library-related. What made you devoted library supporters? Why are libraries so critical to academic and professional success? How has Jim’s service on the Sheridan Libraries National Advisory Council informed your thinking about modern library science? How do you envision the Sheridan Libraries of the future? Interested in leaving a legacy with the part of Hopkins that means the most to you?